Solar wind flowing from the indicated coronal hole should reach Earth on March 30-31. Credit: SDO/AIA. COLLISION COURSE? A comet is heading for Mars, and there is a chance that it might hit the Red Planet in October 2014. An impact wouldn't necessarily mean the end of NASA's Mars program, but it would transform the program along with Mars itself. Get the full story and a video from Science@NASA. Coronal holes are places where the sun's magnetic field opens up and allows solar wind to escape. The sun is literally boiling itself away. 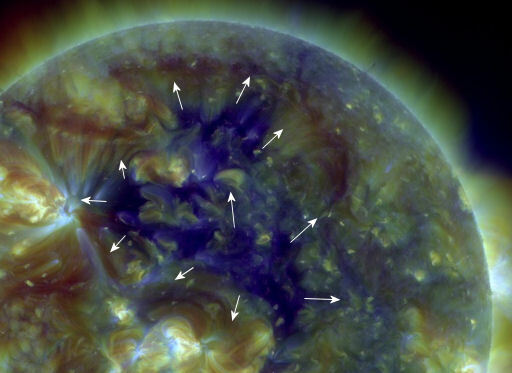 Solar wind flowing from this particular coronal hole is expected to reach Earth on March 30-31. High-latitude sky watchers should be alert for auroras when the solar wind arrives. Aurora alerts: text, voice. 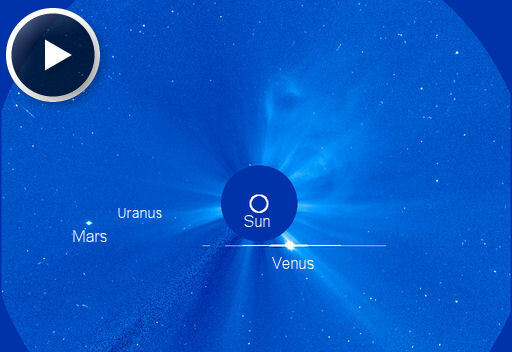 Venus and Uranus will cross paths within 1.5 degrees of the sun on March 27-28. Mars and Venus have their own very close encounter on April 6-7. Mars will be so close to the sun throughout the month of April that it will limit NASA's contact with the Mars rovers and orbiters. According to a NASA press release, "Mars will be passing almost directly behind the sun [as seen from Earth]. The sun can easily disrupt radio transmissions between the two planets during the near-alignment. To prevent an impaired command from reaching an orbiter or rover, mission controllers at NASA's Jet Propulsion Laboratory, Pasadena, Calif., are preparing to suspend sending any commands to spacecraft at Mars for weeks in April. Transmissions from Mars to Earth will also be reduced." Mars will be at its closest to the sun, a slim 0.4 degrees on April 17th. The ongoing dance of the sun and planets is invisible to the human eye, but coronagraphs can see the show. Join SOHO for a ringside seat. 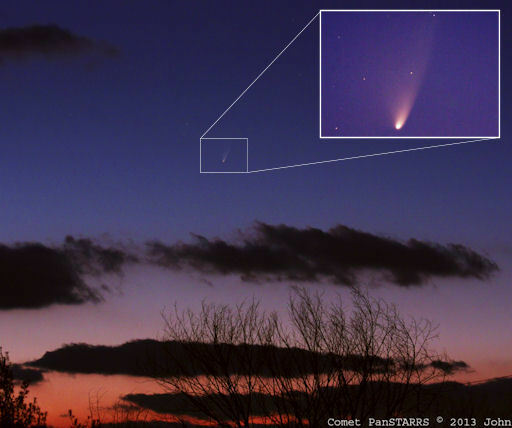 TIPS FOR OBSERVING COMET PAN-STARRS: Comet Pan-STARRS is fading as it recedes from the sun. In recent nights, several experienced observers put its magnitude near +2.3, only about half as bright as last week. Time is running out for easy spotting and photography. "Find a low west-northwest horizon," he advises. "Be ready before sunset, so you can mark the horizon where the sun set as a reference to find the comet. A digital camera with manual settings is all you need to photograph Pan-STARRS. Try 1 to 30 second exposures at ISO settings ranging from 400 to 1600, about 30 to 45 minutes after sunset. The twilight fades fast, so increase your ISO and exposure time to compensate." Click here for additional details. Using procedures similar to Chumack's, photographers have recently captured Comet Pan-STARRS over the Grand Canyon, Stonehenge, Greek monuments, Lake Superior, and many other scenic locations. On March 27, 2013 there were potentially hazardous asteroids.